Be a Tableau certified by learning Tableau from BigClasses. Learn Tableau and its certificate demanded in the a market by the expert in the Business Intelligence field. 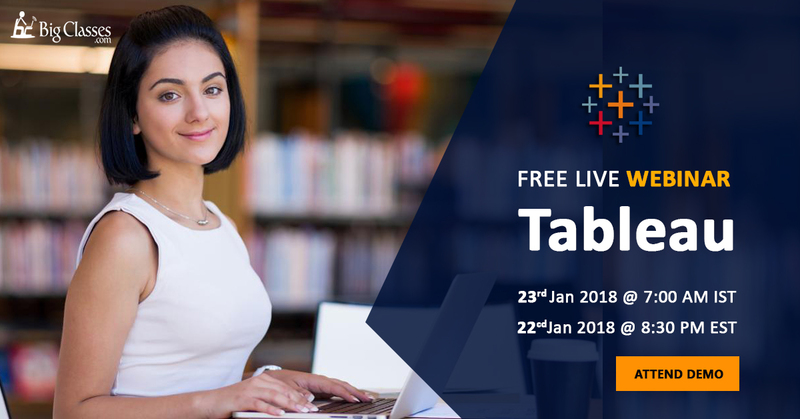 Discover Tableau by joining a LIVE DEMO lectured by Mr Yousuf, Tableau certified trainer at Big Classes with 15 years of experience in IT industry, and 5+ years of tableau experience .The trainer will assist you with a deep understanding Tableau with current job trends and interview questions. You will be able to get an overview of Tableau and its impact in the Business Intelligence.You will also get to know Tableau services in detail with important modules in Tableau. The trainer will also help you with Tableau certifications.